This page, part of the Publications section, contains links to a number of pamphlets issued by the Society. SSS pamphlets 1-7 had, inside the front cover, progressively longer versions of Some Opinions, sometimes in traditional spelling and sometimes in New Spelling (Nue Speling or NS). The Alfabetikal List of dhe Nue Speling was included in Pamphlets 6, 7 to aid in the use of NS. Pamphlets 2,3,4,5,6 were written in Nue Speling. Pamphlet 8 was written in Nue Speling and the reprint in Traditional Orthography. Pamphlet 3 was reprinted, with comments and pictures, in J27 2000/1. In 2005 she summarised it in a leaflet with the same title. 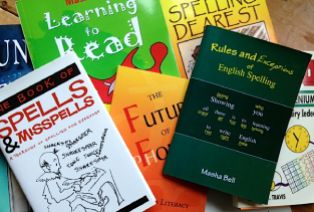 Spelling Reform in Context - a typology, list & bibliography of English spelling reforms, 3rd ed. revised by Chris Upward. Oct. 1998, 24pp (2nd ed. 1992, 20pp, 1st ed. 1991, 18pp), ISBN 0-9506391-7-6.
by Laurence Fennelly. (1991) 33pp. A less drastic version of Nue Spelling, favored by the Society for many years. A Short Account of Simplified Spelling and The Simplified Spelling Society, 10pp. William J Reed. (second edition 1960) 16pp. Children would find it easier to learn a sensible spelling system of English. The Use of Simplified Spelling in Teaching Infants to Read and Write, Incorporating the Results of an Enquiry into the Teaching of English in Welsh Schools, 6pp. Teachers found it easy to teach the regular phonic spelling system of Welsh and did not even attempt to teach English phonics. 2nd ed. 1961 entitled The Phonetic Aspect of Spelling Reform, 8pp. T.O. and Nue Speling shown here side by side for comparison. The Best Method of Teaching Children to Read and Write - Reports of Experiments Conducted in Sixteen Schools, (1924, reprinted in 1942), 19pp. The schools were in England and Scotland. Nue Spelling was used, successfully, but then the children had to transfer to T.O. Adapted from an Interview with Mr. William Archer, published in the Daily Chronicle in November, 1911. (1942 reprint) 9pp. Written in Nue Speling (1942 furst published 1924), 8pp. by William Archer. (1941 first published in 1909) 20pp. by William Archer. (1941 first published in 1908) 16pp. by William Archer. (1941 first published in 1908), 4pp. by Rev. Professor William W. Skeat (1941 first published in 1908) 8pp. Extracts from a lecture entitled “The King’s English: from Alfred to Edward VII,” delivered by the first President, in April, 1902, on the occasion of the Alfred the Great millenary celebrations at Winchester. Written to accompany the S. S. S. Series of Readers and Story Books for Infants. Written in Nue Speling, with a forwurd bie Reginald W. Macan, Late Maaster ov uenivursity Kolej, Oxford. A revue of sum objekshonz to a chaenj in dhe oeld or prezent speling, c.1936, 8pp. This leaflet was Chapter 7 of the 1940 New Spelling and Chapter 9 of the 1948 edition. The Appendix has about 1000 signatories of academics, MPs, bishops, authors, Dominion representatives and head teachers, and about 40 professional organisations. Walter Ripman, M.A., Chief Inspector, University of London. Sir Mark Hunter, M.A., D.Lit., formerly Director of Public Instruction, Burma. Professor R. E. Zachrisson, of The Royal University, Uppsala, Sweden. The Right Reverend Bishop Welldon, Dean of Durham. Harold Cox, Former Editor Edinburgh Review. Godfrey Dewey, .Hon. Secy. United States Simplified Spelling Board. Sir G. B. Hunter, K.B.E., D.Sc.